Product development, Electronics, Firmware and Software Development. We developed the analog and digital electronics for the Fairlight CMI III, and video graphics and other components in earlier systems. 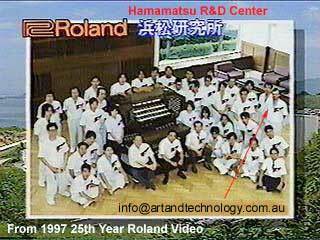 We also spent 15 years in Japan developing musical instruments, software, audio and video processing systems. We are now back in Australia and involved in contract based development. This is a look at just a few developments we have been directly involved with. Contact Us for how we may be able to help you. 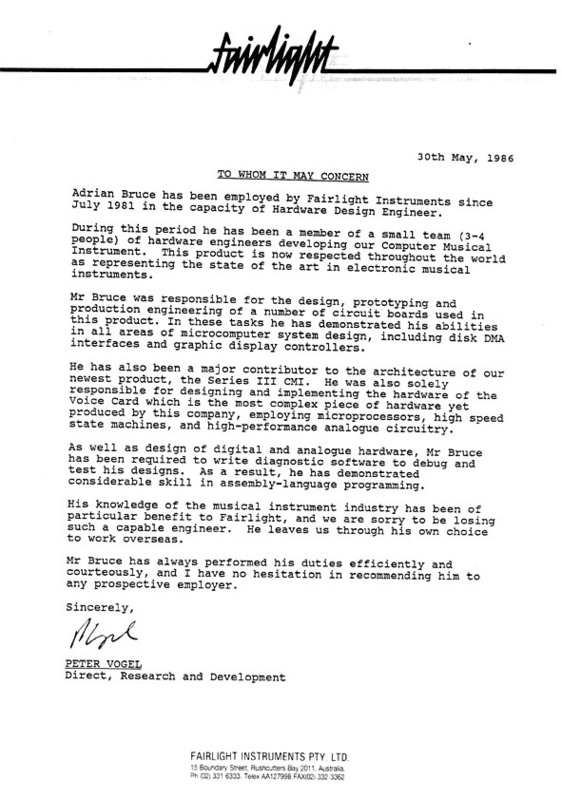 The CMI Series II was a further development of Fairlight Instruments Pty. Ltd. original sampler and music production system. 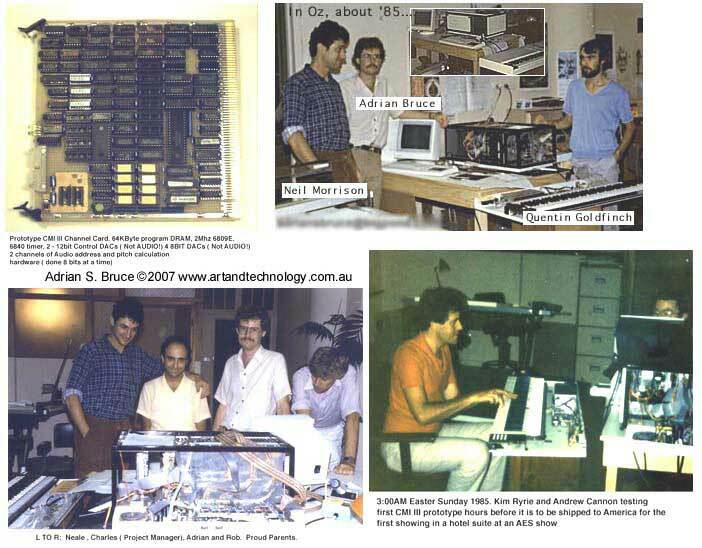 Working for Peter Vogel and Kim Ryrie, and with Quentin Goldfinch, we replaced the Graphics, Floppy disk Controller and Channel Cards. Main difference was the original sound cards used a switched resistor filter that's clocking rate changed with sound pitch and sometimes produced what we called B Flat birdies. The other cards were replaced to use double density disks, and make graphics 1 card instead of 3 and remove any trim pots (and nasty LS123s and LS121s!). There were a few things developed that never went on sale. A Hard disk system, rack mounted CMI (above), companding noise reduction and non- music related such as single board 6809 based office machine workstation. I was the system architect and lead designer of the electronics in this system. Did the original schematics of all the new boards. Digital, analog systems and the motherboard. The CMI Series III kept the original disk and graphics, than totally changed the sound generating system to a shared memory architecture. Added a 68000, eight 6809s, tons of memory, 16 bit stereo sampling and 16 bit, 16 channel output. 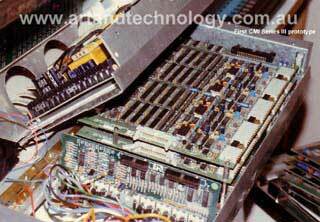 A huge multiprocessor system, that still had to have a lot done in discrete hardware. That was 24 or so 8x8 inch PCBs in the front 19" wide eurorack card cage. It was actually a virtual memory sampler, except the original software didn't support streaming from disc. This is now considered the first modern Sampler. The cards were all originally wire wrapped, above being the channel card. First CMI III prototype images here. The channel cards each had their own processor and controlled address generation, pitches and envelopes for 2 audio channels. The interesting thing about this was the cards calculated 2 channels of 24 bit addresses 8 bits at a time in hardware and accessed a common 300nsec synchronous wave memory. There were 8 slots for memory accesses and that if an audio channel didn't need it's slot (depending on pitch and if the channel was active or not), that could be given to other system devices such as the main CPUs, the 68K or data to and from disc. It was this architecture that allowed the system to grow and change direction, by allowing the 68K (and later 68030) to become the master and eventually ditch the main CPUs ( which were 6809Es ), and change from Sampler to Non Linear Audio Production System as data to and from disc become more important than playing samples statically from memory. More important being related to market charges, where they couldn't compete with low cost modern Samplers. The original CMI-III was to be retrofittable to earlier CMI cases, as in the prototype photos. There were other design compromises made as well, but that is the Art of Engineering. Two layers of analog audio boards against the back panel. After seeing what compromises that involved, Peter Vogel decided another rear facing Audio rack was a better solution and Ron Huby and he repackaged the analog audio electronics with improvements the extra board space allowed. Stereo hard disk recording experiments were done with a visiting Seattle guy Chris Prall (who is now at the University of Washington) , but we didn't see the point at the time, as the hard disks were too small and expensive. So it was more good luck for Fairlight than brilliant foresight on my part. The 10th Anniversary of Fairlight image here. By this time there were also Computer Video Instrument (Kia Silverbrook's invention. As in Silverbrook Research and before that, Integrated Arts, Australia's biggest hi-tech startup failure... will history repeat?) 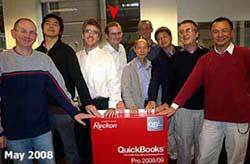 and VoiceTracker development teams, but I wasn't involved with those products. Peter Vogel offered us the role of R&D Manager, so he would become Technical Director, but we were already making plans to move on... my reference from Peter Vogel. The original MFX dumped the music keyboard, and changed the software to focus on hard disk recording, but we were in Japan by the time that happened. We have been told it took 8 or 9 years after I left before they needed to replace the last circuit card that represented the core architecture we put in place. A significant issue was they planned to move the whole company way out west past Springwood in the Mountains, from the Eastern Suburbs, and that wasn't for me....... I still have the Fender Squire given as a going away present. ( I get asked that! ) Play it too, visit the Megacurve demos. A gate array, small battery backed static ram chip and 6802 system. Just keeps on selling. The midi merger used a bitmap, so that sending multiple note ons, on the same channel and note got ignored on the output when mixed. Same code was re-used in A-50 and A-80. Turned out some people made fat sounds by retriggering multiple voices by the same note and channel. The first product proposal was actually just a Midi merger box, that had a pitch bender and some controller inputs, but it was very much something that another maker already produced. This product was all developed and working when it was dropped. A very common thing to happen, no matter where you are. The A-50 was done first, and the A-80 was a minor software change. 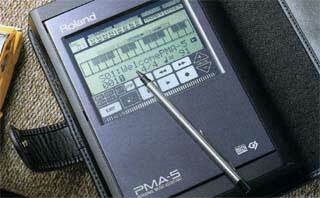 It was the first Roland product to have a large LCD display and softkeys, but it wasn't the first to be released. A story in itself. Also first to use pitch and modulation wheels. Used 2 6802 chips. They were the A series because Adrian and Aota worked on them (with the help of 5 others). The remote in was suggested by Ike in marketing in passing and we put it in. Prototypes had a much lighter aftertouch, but the keyboard mechanism guys firmed it up as the sensor was more linear that way. You could change 1 resistor on the CPU A board to change the touch back and that mod seems to have become rather popular. Also did a custom version that got rid of the SYSEX memory and doubled the number of patches. Very difficult to manufacture and test with the individual key sensors. Polyphonic Aftertouch became one of those things the media wanted, but real players couldn't use. Did sell more than anyone expected, and separate sound modules and keyboards started to catch on. The Owners Manual suffers from the problem that it explains how to set things, but not why, among other things. That all taking up way too much space. For example, the A-50 allows you to remove Active Sensing from the output, even if present on inputs, as it would terminate a soundmodule when muting zones or outputs. All the consequences of options are assumed to be understood by the highend user. Not always true. The backlite for the LCD display can be noisy in a quiet studio, and that can also be disabled. Eric Persing's A-50 for example. 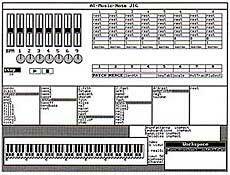 Became very involved with Object Orientated Design and Modeling around 1988 and Smalltalk/V was the system used, in conjunction with DSPs, MIDI and other I/O devices. I built and developed working proof of concept systems. Above is a screen shot of a system that controlled and programmed prototype DSP hardware. A Postscript for sound, that is similar to parts of the MPEG4 spec today. 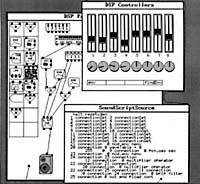 This embodiment was a virtual analog DSP based modular synthesizer. Oscillators, Resonant Low Pass, Highpass and Bandpass Filters, envelope generators, LFOs, Delays, Keyboard MIDI inputs and Amplifiers and Mixers. 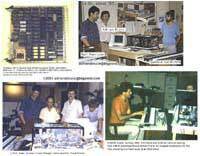 Later, four Japanese Engineers made a graphically programmed system adding sampler hardware to the mix and some new custom DSP hardware. A video was made of this and used as a PR piece to all the overseas dealers as a technological show piece. COSM later came out of all this, but it wasn't what I had called it. Involved in quite a few media related projects that I really would like to continue with. A Silicon Graphics proposal is one that comes to mind as I type this. Stuff with some SoundDroid developers another. Not a lot have became products yet. But rival manufacturers have developed and marketed some similar products over the years. and a domestic Japanese video production system. In there also did artwork, 3D animation for CD-ROM and presentations, and all the other stuff required for proof of concept to get projects considered for continuation. The music Walkstation was going no-where till Yamaha came out with a VHS tape sized portable unit some time later. That always made a difference. 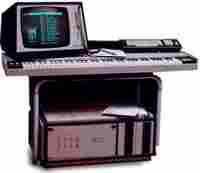 The Music Work Station MPA-5, way before all those iPhone, iPad music applications. Multimedia looked interesting in the early '90s and that focused around Desktop Production. 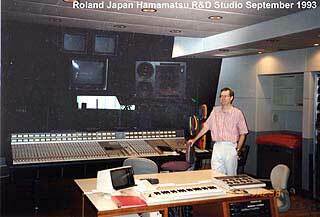 I attended quite a lot of varied production related things with a guy that was at the Roland LA R&D office when it existed. Chris Meyer went on to form Cybermotion with his wife Trish and are now core to the motion graphics field. There were many others that could be mentioned too. 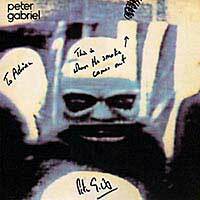 Chas Smith, from Glasgow, was one of the UK marketing people that had made the place a joy. He was Vice President of Sales and Marketing (until Oct 2006) at AVID in the USA, and for some time before that Digidesign. Realtime Audio Pitch, Time and Formant control was developed with a plug in DSP Card and Windows based software tools, such as the above Soundmodule User Interface, data allocation and voice control software. C, C++ and Class Libraries inheriting the world from Smalltalk. Funny how Java today could have been Smalltalk if Sun had got the license they had wanted. Elastic audio allows things like vocal phrases to have new timing and melodies imposed on them. It also allows sampled audio phrases to be manipulated to compose or construct music. Prototyping the concept and demonstrating it working is vital to getting the go ahead. This requires the touch of Hollywood, and the talents of musicians like Australian Adrian Scott, an original member of Air Supply. One Elastic Audio development tool become an application bundled with V-Producer, the control software for the VP-9000, and future products. This tool did the Variphrase encoding, and allowed editing of the makers used to determine attacks (the none elastic bits) and syllables within phrases, and things like tempo. A whole lot of functionality is disabled at compile time for the commercial version. A Mac version was also released. Great chunks of code, sweat and blood (not just from me but, akita, funada, hoshiai, suruhashi, kusekabe, yamamoto, tomisawa and many others), also used in standalone systems. If you ever see the earlier version of V-Trainer windows, look at the About Window, hold down the control key and click the mouse within 5 pixels of the top left hand corner of the graphic area. Elastic Audio became a hardware product with this unit. 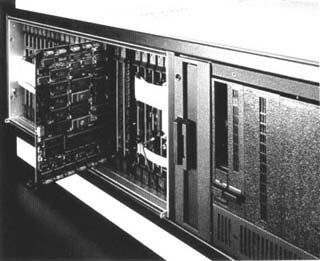 The original system was to be the a 1U rack box and require a computer for the user interface and encoding and connect via USB. Unfortunately, that was before Apple had any USB equipped systems, and the idea was killed off by insistence from musician consultants. The stuff users mostly deal with in this type of product was all developed and simulated using a Mac cross-development system. Lots of the code is written in C, and that part was developed in a UNIX environment and cross compiled for the Hitachi processor that runs the show in the box. There is actually a staff credit roll that is accessed from a debugging menu. Most products have such Easter Eggs, to use the term from the DVD world. 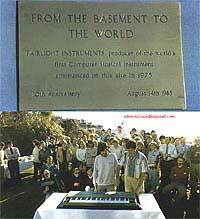 The VA-7 arranger keyboard became the second, with a much more cost effective system architecture. That was developed in a Windows development environment for a Hitachi MCU. ... and I was referring to VSynth. As this is finally out, a year or so late, it isn't a secret anymore. I didn't have anything directly to do with the hands on development of this product, other than it must reuse the encoding stuff we were envolved with. Most likely with modifications and re-writes. It also combines the virtual analog DSP stuff that I tried for years to get done as a product, that first happened as the Roland JP-8000. The Roland VariOS is now a 1U rack with USB connection to a PC running V-Producer. The main V-Trainer encoder code was in a DLL that is being used. If you check above, that was going to be the original Variphrase product concept. It is also software configurable as other types of instruments. NAMM 2003 showed some old hands like Dave Smith coming out with small independent interesting products again. I used to meet up with him at the International Computer Music Conferences. In fact he used to follow us around when I tried to talk to someone. If the business details are right, I could be involved with such sound/music products myself. Why did I leave Japan? Basically the growing nationalism of my boss, Mr Kikumoto, that "Japan is for Japanese!" got too much to put up with. 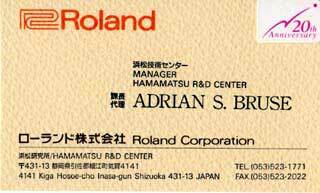 And even though the Chairman, Mr Kakehashi moved me to a team he had, I hoped that my experience being involved with significant Roland Technology between 1987 and 2001 would mean something else where. 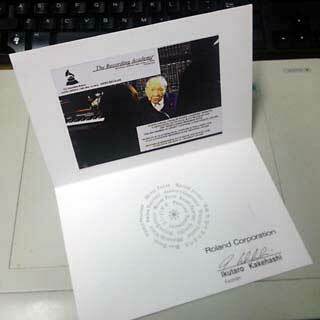 I still get New Year cards from Mr Kakehashi, such as this one for 2013 on the Technical Grammy Award for MIDI. I'm now connected to a few Roland Japan colleagues on Facebook. They were all great guys. Unfortunately I don't think Roland has done anything particularly interesting since I left. Nothing I've wanted to get or use anyway. All the interesting stuff for me is in performance synths, VST and computer based production systems, or guitar related recording gear. Interesting to see Eric Persing started Spectrasonics as Roland wasn't interested in where he was going either. They have factories producing the keyboard version of Mainframe Computers. 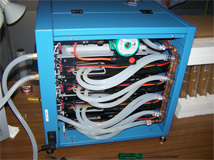 Spent most of 2002 developing custom industrial systems in Australia, and having fun doing it. Such as training systems for Electronic Warfare, Air Traffic Control, Comms, Sonar and Chaffe Launchers. Of the systems we worked on, the Helmsman has received the most accolades, isn't an issue of national security, and so is getting a mention here. On time, under budget, documented, built to last, worked liked it should, and fun to use too. There were no yes-men, inter-departmental middle mangers, just slow metalwork suppliers. It is a real-time 3D ship simulator to teach procedures to budding helmsman. Six student stations with a view from the Bridge are connected to an Instructor station with a Gods view of the harbor that can throw obstacles and bad seas and weather at them. They communicate with the instructor via voice over TCP/IP. The students have real boat steering and throttle controllers. My contribution to this was mechanical / microcontroller / electronics design, project management and leadership to code, manufacture, document and deliver the one off system. The system used modified Morse Controls Helm and Telegraph. The Telegraph was for actuating cables, so the unit was modified to control long life potentiometers via toothed belts and pulleys to be able to generate a value usable by the software. The system was designed around off the shelf PCs, modified industrial consoles and a custom micro-controller for controller interfacing. The PC software was developed in MFC VC++, and used the VTree 3D engine. The interface controller was based on a PIC16F877A (A very useful little device!). This controller was also used in the other training systems developed, as the board could be loaded in various ways, and connected to the PCs via a serial link. Getting things finished requires a framework to organize it all. Project Management, and the variations required by different types of projects is key. Schedules, effort and costs are monitored and so controlled. Project Management is getting a mention, as some believe it is an end unto itself. We don't believe it is. It is however, one of the important tools in the toolbox to get a job done, like source code control, a compile, screwdriver, DSO or soldering iron. Safety critical devices are designed with failure modes and their probability of failure in mind. They also use redundancy to fail safely, continue to operate even with failure, or inform the users that they have failed. There are international standards covering it all. There are also processes for development, testing and manufacture to guarantee all this... spent time working in this area in 2004.... and there is a lot more than can be said. We are the only one in this country to apply Standards EN50128, EN50126 and EN50129. Making LOUD, very efficient, vandal proof audio alarms is part of that world, and here is a small horn loaded unit. A two part aluminum cast horn was designed around a telephone ear speaker, to produce a Weapon of Mass Annoyance. Used SLA to print 3D Solidworks parts for testing, after the Super Sculpey polymer clay stage refined the design. This little unit produced over 91dB 'A weighted' at 1m with the tones required. Automated downloading of data via Wi-Fi (802.11g) and then extracting useful information was an interesting design concept. Unfortunately, all the hype surrounding Wi-Fi, it has a tendency to remove the focus from the real problems to be solved, which were the store and foreword base stations, the Database design and Data Mining. What we ended up demonstrating was the first algorithms designed did show up trends that were not obvious, and had been unseen in 5 to 10 years of using the raw data. That Excel was the tool used to do the prototyping, and that it was so successful has very much changed the way we now view it and the SQL server, MSDE. Shrink wrapped software development and management. We developed an Electrophoresis Device, used in DNA research. 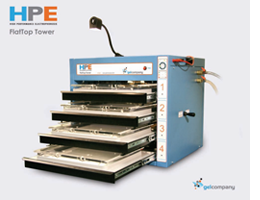 This required very high voltage control and monitoring, water cooling and be manufactureable. Prototype concept sketch. 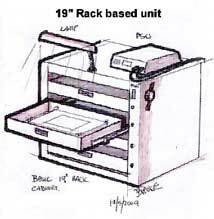 We work with an automated metal cabinet manufacture to provide custom cases and internal cable tubing moving carriers. The ability to quickly describe visually components has always been a key to smooth communication. Fabrication and refinement. The initial units used a ceramic tile the German customer insisted on using that we replaced with a custom made subsystem from Kyocera that dramatically simplified the unit by incorporating a trough and wall into the ceramic part. The unit is currently the worlds best Electrophoresis system. We have designed custom audio related test sub systems for very well known manufacturers to simplify their core business. This being a very specific type of audio and power software controlled patch bay. Features custom electronics, firmware, CPLD, metal and plastic case components. Designing the labels and having them manufactured too. And been brought in to analyse issues too, when not involved with new development. Experience means something. 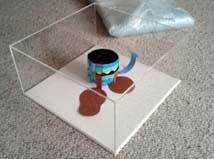 This is one of 5 custom acrylic artwork display cases, with invisible, but removable fastening between the lid and base. We have also been involved in successfully managing huge shrink wrapped commercial software projects, websites, strings of NDA covered scientific, commercial, medical and other devices and systems as a consultant. Contact us for how we may be able to help you.